Is Permanent Makeup Safe? What You should know. Thanks for the question. I’ve taken a look at what experts have to say about permanent makeup to give you a little more information about this trend. Why is it becoming so popular? According to a 2014 survey, women spend an average of 55 minutes every day on their appearance, including their makeup routine. And according to a recent video by Money, the average woman in the US will spend around $15,000 on cosmetics over the course of her lifetime! Women of all ages are deciding to reclaim some of their time and money by using cosmetic tattooing to change their lip color, imitate eyeliner, or define their eyebrows. Permanent makeup, also known as cosmetic tattooing, is the same procedure as traditional tattooing. A technician uses a needle to insert pigments into the dermis layer of the skin to change the skin’s appearance. The most common changes are made to the lips, brows, and eyes to imitate the look of cosmetics like lipstick, eyeshadow, eyeliner, and brow liner. With help from a permanent makeup professional, women choose which colors they want, sometimes receive topical anesthesia, and undergo a tattooing procedure lasting up to several hours. The immediate results are usually much darker than the final results, and the colors lighten up during the first several days of healing. The results may last for months or years depending on factors like the type of pigments used and sun exposure. 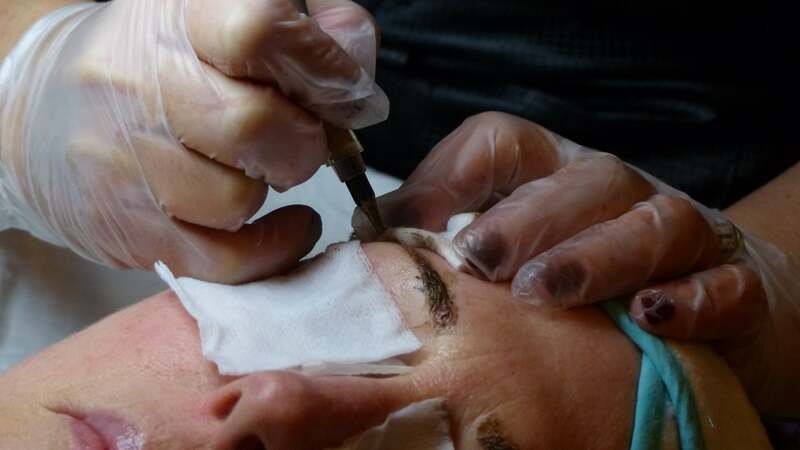 Permanent makeup is generally considered safe. It carries the same risks as other tattoos. The most serious is the risk of infection from improperly sanitized tools and equipment. Tattooing services are regulated on a local level, and your state or local health department can give you more information about regulations in your area. Always make sure the professional you choose to work has any necessary certifications or licenses and is able to answer safety questions to your satisfaction. You should be able to see your technician open new, sterile needles in front of you and use new gloves for your procedure. Other risks are less serious but still worth noting. According to the Food and Drug Administration (FDA), allergic reactions to the pigments used in tattooing and permanent makeup are rare, but they can be hard to treat because the allergen is very difficult to remove. The FDA also lists granulomas (nodules that form around foreign material), keloids (excessive scarring), and removal problems as risks of permanent makeup. And if you opt for permanent makeup and later need an MRI, you should inform the technician. Sometimes people with permanent makeup who undergo MRIs experience swelling or burning around the tattooed area, but these effects are temporary. For most people the process of getting permanent makeup is at least uncomfortable. Most people who receive tattoos report discomfort, and the lips and eyelids are very sensitive areas. While topical anesthetics usually aren’t used for traditional tattooing, they’re common in the field of permanent makeup, and your technician can discuss the options with you. Since most procedures last at least two hours, it’s important to let you technician know early on if you’re in more pain than you think you can reasonably withstand for that amount of time, but keep in mind that, as with all tattooing procedures, there may be a certain degree of discomfort that’s unavoidable. If you have other health-related questions, you can always talk to your doctor about how to minimize the risks of any tattooing procedure.